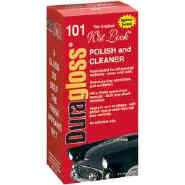 Duragloss® Wet Look® Polish and Cleaner leaves vehicle finishes looking showroom new. And, it helps keep them that way thanks to synthetic polymers that form a protective coating on the painted surface. It's also durable under both acid and alkaline washes and it can be applied to the whole surface in sun or shade. Plus, it removes easily, leaving a "wet look" shine and protective coating behind.